UPDATE: I initially wrote this post when these rules were initially proposed. Now that they have been approved by the Federal Communications Commission, we enter a new era in the regulation of the internet. The the post below is still relevant, but I want to add a couple of additional points that may help enliven the discussion. 1. In the coming hours and days, there will be accusations from supporters and detractors that the decision has either freed or ruined the future of the internet. Both sides will also claim that net neutrality will impact future innovation by limiting business models or creating certainty and growth. These arguments will begin to look very similar. The issues are extremely complicated. 2. The internet is an experiment that is set to continue an uncharted path into the future. The internet, more than any other medium in history, has helped facilitate the exchange of ideas between billions of people. It has become an entity of its own, and presents perhaps the grandest cross-cultural experiment in history. For years, Google kept products in “beta” phases because things were still evolving. The internet is much the same. It is still in beta, as programmers often say, but we don’t know where it will take us next or how it will mature. And with that, enjoy this post where I explore two aspects of these new rules. As the Federal Communications Commission (FCC) begins the process of reviewing new rules that would regulate Internet service providers, we started wondering how these proposed rules would impact PR and social media. Our conclusion: the new rules will create a positive impact on public relations and social media, but it may be a bit of a wild ride and some of the impact is likely to be felt indirectly through cultural shifts. First, let’s back up a bit. Let’s face it, for most of us “utility regulation” is probably a more effective cure for insomnia than C-SPAN. To make this less painful, here is a quick synopsis. 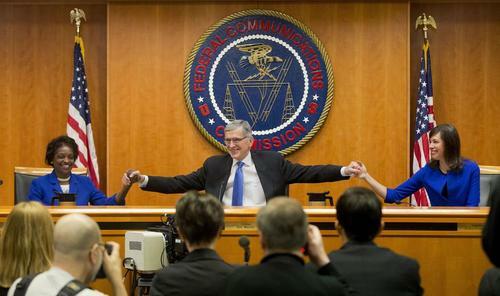 The FCC is proposing new rules that would regulate Internet service providers in the same way as telephone providers. This move would also give the FCC additional authority to impose two other important new rules: net neutrality and rural broadband access. Net neutrality, the concept that an Internet service provider can’t decide to charge more based on the type of content streaming across the provider’s system and to your smartphone or computer, is shaping up to be the biggest fight over the new rules. Codifying net neutrality into permanent FCC rules would essentially maintain the status quo—making the rules permanent which would in turn add certainty to the market. Companies and inventors like certainty because it means the rules will remain the same as new concepts are developed and introduced to the market. Net neutrality would preserve the current “Wild West” environment where any company can emerge to be the next Facebook or Google if they can get enough users. The other big change is rural broadband access. When telephones (the wired type) were first connecting communities across the nation, rural communities were some of the last to be connected to the growing national network. In the end, a mix of government subsidies and rules helped connect rural residents to the nation’s telephone grid. Now, broadband Internet is poised to follow a similar path. This will create the biggest impact to public relations and social media. Those of us who live in urban environments may not realize that only 51% of Oregonians have broadband Internet access at home. This means 49% of Oregonians were likely unable to watch those awesome Super Bowl commercials on YouTube or enjoy other bandwidth-sucking content online. With expanded broadband access, it will be easier to use online video content to connect with audiences in rural communities. The geographic dispersion of these communities makes rural residents more difficult to access. Having another tool, such as online video, will be helpful in any number of different campaigns. It may also have another, subtle impact: rural residents will be able to watch the same streaming shows as people in New York and Los Angeles. This may help further decrease the cultural gap between urban and rural communities. Overall, these changes are positive for public relations and social media. Net neutrality will add certainty to the future of some technology platforms we are already very comfortable with, such as online video. New interactive platforms that take online video to a new level may also be possible without paying additional money for the bandwidth to access users. These are both very important and positive for social media and public relations. The biggest change, broadband internet in rural communities, will present a significant shift for the way we access this audience. These residents will be watching House of Cards and other hit shows on video streaming services. They will be more likely to understand popular references from streaming television, and they may even enjoy the occasional (okay, constant) cat videos on YouTube. This helps bring communities closer together, with shared experiences. It means that popular references and framing can be used effectively in both urban and rural communities. Public relations practitioners will still need to be careful and understand the cultural differences that come from rural life, but the access is at least easier. Together, these changes present a positive and welcome change from the past uncertainty and slow developments associated with high-speed Internet access.